Sherlock Holmes and Dr. Watson had been investigating the theft of the Crown Emerald and were seized by Moriartys henchmen. They were now being held captive in the basement of the archvillains home. And if we dont? Holmes inquired. Then, lets begin. Moriarty grinned. The cards have already been shuffled, so Ill deal each hand to save time. Colonel Moran? I know youre not a bridge player, but sit down as my partner and just pass. Holmes? You sit here on my right. As fate (or the Professors evil design) would have it, Holmes became declarer on each deal. In August 2003 these problems were presented as a contest, which had 838 entrants from 114 locations. The contest is now closed, but you can still challenge yourself and find your score immediately. On each of the six problems, you are South, and all you have to do is choose your play from options A-F. Each option is rated on a 1-to-10 scale based on my judgment. Bidding and carding by West (Moriarty) is standard, and assume expert skill. For a reference on these agreements, see my outline of Standard American Bridge. Do not draw any inferences from East (Moran) who always passes and knows little about card play except to follow suit. After winning the A, how do you play? Lead: 10 East plays Q if you play jack; else 4. West next leads the J (won by king) as East plays 3. Your play? You win K-Q on which West pitches two hearts. What next? Credits to Sir Arthur Conan Doyle (1859-1930) creator of Sherlock Holmes. 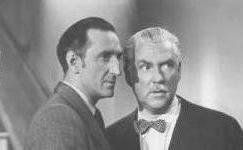 Photo is Basil Rathbone and Nigel Bruce as Holmes and Watson.